TheTron Tavern was situated on London Street now London Road near Glasgow Cross. In the 1870s spirit merchant James Duthie owned a smaller public house here, over the years the pub had been extended taking in vacant property, as you can see by the photograph above the pub extends over the different tenement buildings. From 1887 to the beginning of the 1900s the pub was known as The Pacific owned by wine & spirit merchant Colin Cummings. Mr Cummings had other Pacific bars in the city, one on Parliamentary Road and one on Castle Street. Colin rented the premises on London Street from Gray Edmiston a well known publican and property owner in the licensed trade, Mr Edmiston left the licensing trade to concentrate of renting property out to other publicans and other businesses in the city. He owned pubs on Commercial Street, London Street, Cowcaddens, Trongate, Garscube Road, West Nile Street and two pubs on the Gallowgate. 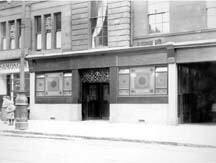 Another publican to own the pub was Patrick Griffin, he paid an annul rent of £110 to Mr Edimiston from 1912 to after the First World War, he also owned the Mermaid Bar, Cowcaddens. The pub stayed in the same family until after the Second World War, after the war a lady was licensee Mrs M D Henderson. The Pacific Bar during the Coronation 1953. During the 50s Mr R T Blevins was running this popular bar, he also ran the Railway Bar, London Road at the junction of Charlotte Lane a pub on Shamrock Street and the Tron Bar, Bedford Street south side. Interior view of the Tron Tavern. 1966. Scottish Brewers took over the pub during the 60s and appointed a manager Willy Milroy. John Lynch of the famous Old Barns on London Road also owned the pub during the 1970s, this old pub was demolished as the building was now very old and in great need of renovation. Publican John Lynch was frothing yesterday over a water bill for one of his three bars in London Road, Glasgow. The claim by Strathclyde water department for 18 months' supply to the Tron Bar at 67 London Road was said to be £900, covering five million gallons of the wholesome stuff. Mr Lynch refused to pay, his supply was eventually cut off, and yesterday the dispute came to a head at Glasgow District Licensing Court when his licence for the Tron was revoked. The court was told that since October Mr Lynch has been carting beer kegs filled with water from one of his other bars, the Old Barns, more than 200 yards up the road. The water has been poured into a basement tank at the Tron and channelled by way of an electric pump to the bar fittings. But the system brought swift disapproval from the police and environmental health officials, who raised their objections at yesterdays half-yearly sitting of the Court. It was said there had been serious concern since November about the pub being operated without an adequate water supply. And it was claimed that on March 7 there was so little water in the tank that neither bar fittings nor sanitary convieniences were being served. An agent for Mr Lynch argued that the dispute over the 5,000,000 gallons might lead one to wonder just how much beer was being sold in the pub. Mr Lynch, aged 38, said later he would be lodging an immediate appeal and accused the water department of bureaucracy. He claimed: "My normal bill for 18 months would be something between £50 and £100. Despite my protests the water board has notified the health people, who have put the pressure on me." However, a spokesman for the Strathclyde water department stated last night that a bill was for £829 covering some 4,000,000 gallons dating back to 1974. 1947 Mrs M D Henderson. Willy Milroy manager of the Tron pulling a pint. 1966.